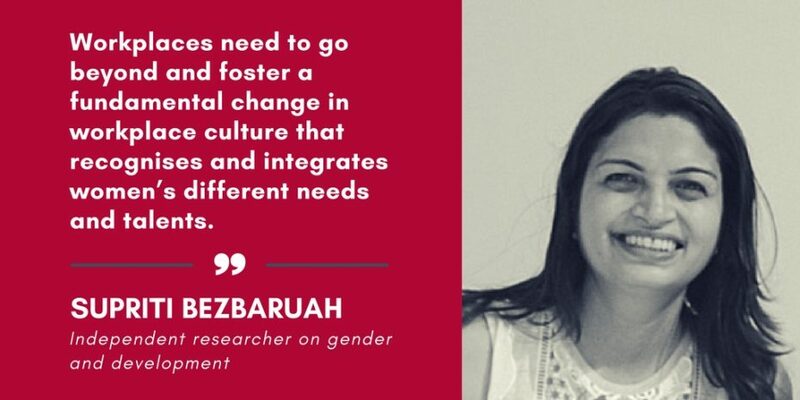 Supriti Bezbaruah has over 15 years of experience of research on gender and development issues. She is the author of the book ‘Banking on Equality: women, work and employment in the banking sector in India’ published by Routledge. She is currently a Research Fellow with the International Longevity Centre (an initiative of Tsao Foundation), Singapore. She also serves on the Board of PrimeTime Business and Professional Women’s Association. 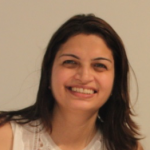 She has previously worked at among others, the United Nations Development Programme (UNDP) in India, the Institute of Development Studies (IDS) in the United Kingdom and the Institute of Southeast Asian Studies (ISEAS) in Singapore. She completed her BA (Hons) degree from Oxford University, her MSc in Development Studies from the London School of Economics and Political Science (LSE) and a Phd from Queen Mary, University of London. Last month, as the world marked International Women’s Day, it seems that Singaporean women had plenty to cheer about: the small city-state outperforms its regional counterparts in many measures of gender equality. In 2014, it was ranked as the top Asian country on the United Nations Gender Inequality Index (GII). Last year, the World Economic Forum’s Global Gender Gap Report observed that Singapore “is the country that has made the most progress in the region” in economic participation and opportunities for women. According to the Mastercard Index of Women Entrepreneurs, Singapore is among the top countries for fostering female entrepreneurship. Singapore also does well in STEM (Science, Technology, Engineering and Mathematics), with a 50% increase in the representation of women scientists and engineers holding PhDs. Nearly one in three of all research scientists and engineers (RSE) are female, a ratio higher than countries like Germany or France. Despite such commendable progress, as we know, no country in the world has achieved gender equality, and Singapore is no exception. There is room for improvement. First, while the number of women working has been steadily rising – from 54.3% in 2006 to 60.4% in 2015 – there are still far fewer women working compared to men (76.2%). Second, although according to the ILO’s Global Wage Report 2016/17, Singapore’s gender wage gap is among the lowest among many countries, women still earn less than men, with the gender wage gap estimated to be about 10.3% in 2016. Not surprisingly, 63% of respondents for a survey conducted in 2016 believed that a glass ceiling still exists in Singapore. So, what holds women back? In Singapore, the main problem seems to be juggling work with family commitments. In a recent survey, 57% of working mothers cited work-life balance as the top challenge for career advancement. Because of these pressures, women don’t stay in the workforce for long. While both men and women enter the labour force in roughly equal numbers in their 20s, from 30 years onwards, women tend to leave. The main reason? Family responsibilities (housework, childcare, care-giving to families/relatives). Finally, gender stereotypes continue to hinder women’s career advancement. For instance, a white paper on women in the workplace found that 32% of Singaporean women believed that the under-representation of women in leadership is due to a preference by management to promote men over women. Similarly, in another survey, more than half (59%) of women attributed gender stereotypes/assumptions as the most significant barrier to hiring experienced female talent. Madame Halimah Yacob, Speaker of Parliament notes, “It may sound strange that in this day and age we are still talking about the glass ceiling…” So what can be done? For a start, policies, from diversity champions to increased parental leave to flexible work arrangements are important, and need to be sustained. But workplaces need to go beyond this and foster a fundamental change in workplace culture that recognises and integrates women’s different needs and talents. This articles was written by the author in her personal capacity. The opinions expressed in this article are the author’s own and do not reflect the view of any organisations or institutions. ILO 2016. Global Wage Report 2016/17: Wage inequality in the workplace. Geneva: International Labour Office. The Economist Corporate Network. 2016. Women in Leadership in Asia Pacific. Sponsored by Willis Towers Watson. Ministry of Manpower. 2016. Labour Force in Singapore 2016. Singapore: Ministry of Manpower, Manpower Research and Statistics Department. Credit Suisse. 2014. The CS Gender 3000: Women in Senior Management. Zurich: Credit Suisse Research Institute, pp. 13 – 14. One of the key challenges faced by working women is striking a harmony between work and personal or family life. Singapore women are more likely to drop out of the labor force after marriage and childbirth.